Do SBI Websites Work? This One Does! Do SBI websites work? Yes! Site Build It!, or SBI!, is the software I use for building Complete-Strength-Training.com. And I wouldn't use anything else. I love exercise. I love researching and studying new body conditioning methods and finding out how to make my body work better. And this website allows me to do that. See, for a long time in college I was wondering what I would do once I'd left. I like Japanese and Chinese language, physical training, and a host of other things - but I didn't want to get tied down to a job job. That sounded boring and time consuming. And I wanted to travel, and have something where I could make money on the road as easily as at home. And a vocation that I could build bigger over time - not a treadmill or piecework. I decided to try my hand at making money on the internet. After all, it's the 21st century - I should be able to do this! After a few, um, 'learning experiences' I found SBI! and started Complete-Strength-Training.com. That was mid-2009. Now, Complete-Strength-Training.com gets about 2,000 unique visitors each day, and that number goes up almost every month. I get to research and write about what I love, help people get in better shape, and make money doing that. Is this great, or what?! 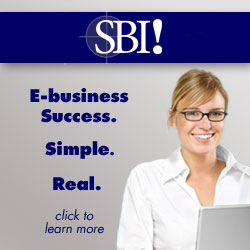 SBI!, promoted by the company SiteSell, is the only service I know of that helps real, non-techy people to build their own web businesses. It gives you the business plan and tools to research and find your perfect topic and niche, come up with good keywords to write content about on your site, and how to optimize your site for search engines (called SEO, or Search Engine Optimization). And lots more! SBI! also tells you specifically how to go about promoting your site, how to write for the web, and how to get tons of traffic. And once you get traffic, how to convert that traffic into money. Choosing your own niche is the most important thing. If you choose the right niche, one that you're passionate about and love writing about, and research it well, then writing your website will be a walk in the park - and you'll be able to get lots of traffic. My niche is strength training. With a little bit of fitness/exercise/diet info on the side. Once you choose your own niche, you'll find out how much fun it can be to write. I like strength training and exercise, but you might like comics or vegetarian cooking or wiener dogs or sailing or martial arts or meditation or… anything else! There are people all over the world searching the internet for all sorts of information, and there's probably someone searching right now for information on a topic you know really well. Give them great information about that topic, and they'll love you and your site. Find your niche, and write about it. This attracts people, and people who like your site - and by helping them solve their problems and answer their questions, you can make money. Pretty simple. It's hard. There's no sugar coating that. Just like building strength. Or anything else worth having in life! Even with SBI websites you have to write and research a lot about your topic, or 'niche'. You have to learn what building links is all about, a little bit about how the intent works, and (no matter what anybody says) build a business takes work. This no 'get rich quick' scheme. But with SBI!, it is doable for non-techy people to build profitable websites online. I've been at this since min-2009, and I know that the longer I stick with it the bigger this site will get, the more experienced I'll become, and the more money I will make. It takes time and hard work. But really, if you could write about what you love for your job, wouldn't that be worth some work. If building an e-business appeals to you, check out SBI! You won't be disappointed. • Click here to go back to the About Me page! • Click here to leave 'Do Solo Build It Websites Work? This One Does!' & go back to the Home-page! Do Solo Build It Websites Work? This One Does!